You will not have to worry about the pen's problem, we will take care of your pen. 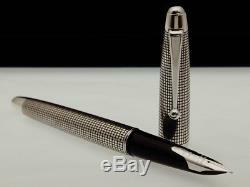 This pen is the Pilot Silvern Sterling Silver model: Tsumugi Silk Thread version. This pen's design brings back all the image of Old Japan Beauty. The pen came packaged in the standard Pilot pen case. The pen was sealed in a polythene wrapper with a hang tag on the clip as is the usual practice with Pilot pens. I felt neutral about the pen, but when I cut open the wrapper and pulled the pen out, the true luster of the pen began to show. The surface of sterling silver is engrave with many small straight lines, make the design looks like hairlines pattern. Because of the pattern the color of the body is not so shiny, but it has its own beauty which I really like about. When you uncapped the pen, a 18kt Gold nib with Sterling Silver coated layer shows up. This 18Kt is totally different with all other Pilot nibs but it gave same smoothness and good feedback. The Nib and writing experience. Generally Pilot nib sizes run one size smaller than their western counterparts. The nib design as I mentioned earlier is plain and simple, no ornate engravings or scroll work here. The nib sports a different logo than usual and it would be nice if anyone can shed some light on it. A stellar performer out of the box! The feeder even though resin does its job very well, regardless of the material the thing that counts is who is making the feed, Pilot feeds have been outstanding so far in my experience. However posting and locking the cap (more on that later) yields a very comfortable and balanced feel and the added length helps. Collection: Silvern Sterling Silver 925. Body Material: Sterling Silver 925. 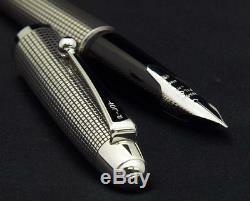 Nib Material: 18K Gold Sterling Silver Plated. Nib Size: F (Fine), M (Medium). Refill Mechanism: Converter (CON-20, CON-40), Proprietary Cartridge. Compatible Inks & Refills: Ink Bottle and Proprietary Cartridge. Diameter - Max: 11.5 mm. Our mission is to deliver the best writing instruments and the most satisfactory writing experience ever. 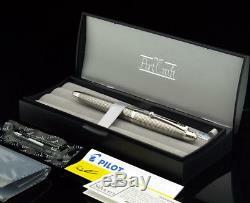 PILOT NAMIKI Silvern Ishidatami Lattice Sterling Silver 18K GoldNib Fountain Pen. Take a look at our other products! PILOT NAMIKI Custom URUSHI 18K Gold Nib Ebonite Black Fountain Pen. Sailor Limited Edition Saijiki Professional Gear Slim 14kt Nib - Blue Ocean. SAILOR Limited Edition Professional Gear Slim Demonstrator 14kt - Hawaiian Ripe. Sailor Limited Edition Saijiki Collection Professional Gear Slim 14K - Aomidori. SAILOR Standard Fountain Pen Ink Converter - Gold. PILOT NAMIKI JAPAN Fountain Pen Ink Converter CON-40. 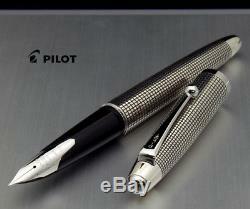 PILOT NAMIKI JAPAN Fountain Pen Ink Converter CON-70. 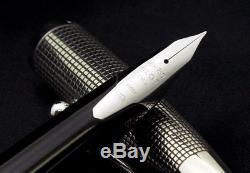 PLATINUM JAPAN Fountain Pen Ink Converter CON-500. PenSachi - Writing The Happiness. Your pen can bring you happiness and we are here to bring you that pen. All of us at PenSachi love to make you happy by delivering to you the best writing instruments and the most satisfactory writing experience ever. It is all about passion, experiences and love when talking about our journey to build up PenSachi. I would love to tell you my story about writing which led us to the idea of making PenSachi today. You might share with me same experiences that I have been through. I have come to know about writing and love it as an interest, a hobby, a passion, a dream and now it's my whole life journey. My ever dream is that I could start a business which would make people experience, enjoy and be happy. With my journey to many countries in the world, I was so luck to become friends with people who also share with me the same interest and passion in writing instruments. They have come all the way to Japan and started this new journey with me. After a year of hard work on preparation, we would like to officially announce the foundation of PenSachi company. And this is how I met them and final made PenSachi. With an inherited interest: - Routine and Curiosity. Until PenSachi is finally made, it is a long journey to the West and the East of an amateur freelance writer with a passionate interest in handwriting. I fortunately inherited this interest from my grandfather who used to be a practitioner of Chinese and Japanese calligraphy which many of young Japanese nowadays might rarely now about. With a hobby of a collector: - Experience and Joy and Friendship. I still kept the hobby of writing and collecting fountain pens even after I moved to the West for study in 2000. I found out how lucky I was to be in Japan as it was not that hard to get a fountain pen or brush pen for calligraphy compared to here in Europe. However, it was such a destiny as I could meet and become friends with those people who also share the same interest in writing instruments. It was somehow different in the way we think and practice calligraphy because of national identity but it then became more amazing as while sharing Japanese cultures I could also learn new things too. As a business man: - Career and Dream and Passion. After graduation, I came back to Japan and worked for a company which actually has no relation to my hobby but it never stopped my interest in writing and calligraphy. If writing from a pen collectors perspective is something of habit, joy and experience, for a business man, it is also about manner, career and dream. However, they have one thing in common - PASSION. As long as we have the same passion, we are all connected. As a dreamer/ companion / sympathizer. Far to the Northwest of Vietnam, for many children in Mai Chau or Sa pa, owning a good pen can make them more than happy. Or for many elder-lies in remote villages of China, having a good brush pen to practice calligraphy becomes such a fancy wish of their whole life. It might be so easy for of us to have writing as a daily hobby but for many others it is a dream and it might bring us a joy but to many other its an absolute happiness. A pen symbolizes imagination, creativity and passion. FREE to ASK: Yes, you are all free to ask us 24/24 through any channel. We will be happy to receive your contact and definitely help you out at our best. We directly obtained them from manufacturers with original parts and accessories. We make sure that you will be happy receiving your item in original package with the best and authentic quality. This is a special policy that you can only have with PenSachi. It is provided in product technical specifications. We will help you to send your item(s) to the maker for a repair or replacement. At PenSachi we guarantee that all products are 100% authentic quality goods. It is unfortunate that you want to return the item for any reason. For a pen, it is considered as used if the ink has run through any part of the pen, the included cartridge, converter or piston filler is not intact and touches ink, also all tags and accessories are intact and not removed. For replacement, since a replacement might not be available in stock at that moment, after checking we will let you know whether you can have the same item or there are other options for you to choose. Return item model number or name 4. Condition of the item (please attach the pictures too). 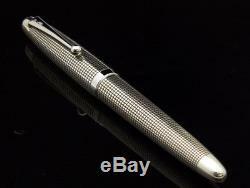 The item "PILOT NAMIKI Silvern Ishidatami Lattice Sterling Silver 18K GoldNib Fountain Pen" is in sale since Tuesday, June 19, 2018. 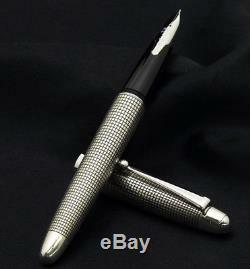 This item is in the category "Collectibles\Pens & Writing Instruments\Pens\Fountain Pens\Pilot".com*" and is located in Tokyo. This item can be shipped worldwide.